The Tecno Camon X and the Infinix Hot S3 has been around for sometimes now, both of which had a lot in common. I had previously a specification comparison of both smartphones. However, Infinix took the wrap off the Hot 6 Pro few days ago, and for those who’ll be asking questions as regard to what is could be the best option between the Infinix Hot S3, the Tecno Camon X and the recently announced Hot 6 Pro, then, this post is for you. One very important thing note however, is the fact that the Infinix Hot 6 Pro is the most affordable device on the list, but considering how Infinix is shifting gradually from Mediatek CPUs, we thought it’ll be wise to see how the Hot 6 Pro fairs against the Hot S Pro. So Which is for You? 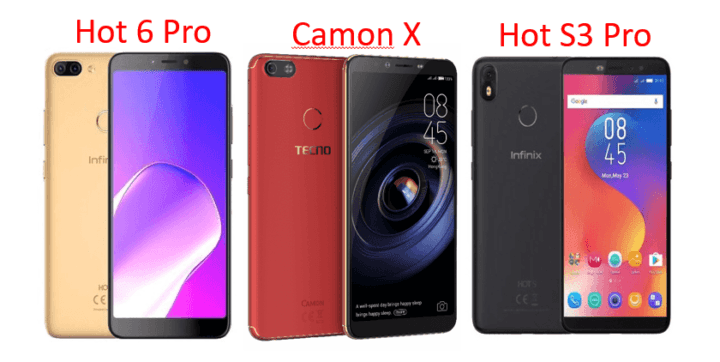 Infinix Hot 6 Pro, Tecno Camon X or Infinix Hot S3? Wait a minute, should the question be which is for you or which is for me. I mean, if i’m to be in your shoe, which of these three smartphone will I pick? More display estate than the S3 Pro. Cheaper and offers overall value for money than the Hot S3 Pro. Then I could consider the Hot S3 Pro. But what if I’m loyal to either of the above brand or model? Then I wouldn’t mind what one device have that the other do not have.